See how the CEO managed to rack up 150,000 miles in one year. To hear Elon Musk tell it, 2018 was a terrible year. “It was excruciating,” he lamented to The New York Times in August. But a Washington Post story published Tuesday paints a different picture. 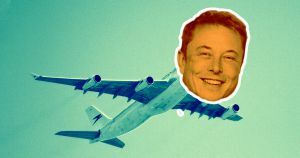 The newspaper tracked every trip Musk took on Tesla’s corporate jet in 2018 and found that while his company was burning through $100 million per week and laying off thousands of employees, the billionaire was jet-setting across the globe — mostly on the company dime and definitely not always for business purposes. According to WaPo, the jet flew in excess of 150,000 miles over the course of more than 250 flights in 2018 — and Musk wasn’t even always on board. Sometimes, the jet was simply flown from one part of L.A. to another so Musk could meet it at the closest airport. When Musk was on the jet, many of his trip were business-related, taking him to and from the airports nearest SpaceX’s headquarters, Tesla’s headquarters, and Tesla’s Gigafactory. But based on the WaPo report, Musk also took a vacation in Chile, spent spring break in Jordan and Israel, and visited the sets of two HBO dramas: “Westworld” in Texas and “Game of Thrones” in Northern Ireland. But other CEOs seem to manage just fine. Amazon CEO Jeff Bezos took 100 fewer flights than Musk in 2018, according to WaPo. Apple, meanwhile, spent $93,000 on flights for CEO Tim Cook in 2017 — Tesla reportedly shelled out $700,000 for Musk’s travels that same year. And Bezos and Cook head up companies that actually could afford to bankroll a flight itinerary comparable to Musk’s. Still, even if that’s true, $700,000 is a lot of money to spend on business-related travel in one year, and based on WaPo‘s report, Musk flew just as much — if not more — in 2018 than he did the year prior. When Musk laid off 7 percent of Tesla’s staff earlier this month, he said it was because the company needed to cut costs. The next time it feels an urge to streamline finances, it might want to take a hard look at how often its CEO goes wheels up on the company dime before handing out pink slips.